An historic, Victorian timber merchant’s property; peaceful village setting; beautiful garden; car parking; spacious comfortable rooms; separate TV/dining room. 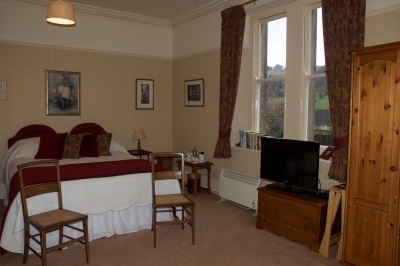 Bedrooms are large, light and airy; recently decorated and carpeted throughout, with a variety of period furniture and king sized beds. Welcome to the website for Woodchester Lodge, one of the Cotswold’s best kept secrets. 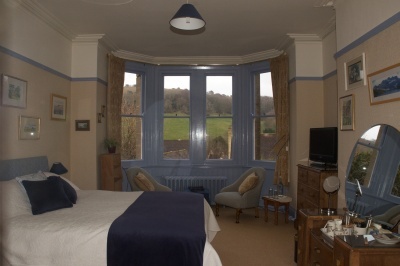 Woodchester Lodge nestles in the valley between Stroud and Nailsworth in the South Cotswolds. This area is one of the more undiscovered areas in The Cotswolds, but has plenty to offer for the visitor, with numerous activities and attractions available locally. The main hall is one of the best features of Woodchester Lodge. Incorporating a wide grand staircase, framed with oak turned banisters, it acts as a central pivot to the house, giving access to all other rooms. There is a great feeling of space and height here, culminating in an attractive barrel vaulted ceiling. It is a room in its own right, complete with wood burning stove and bookcase for browsing. The visitors’ living/dining room offers many possibilities. 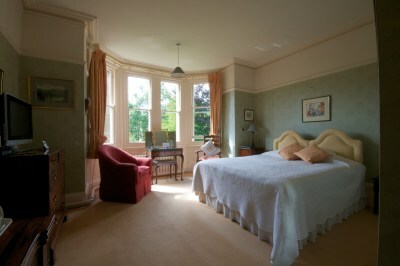 Furnished with a variety of antique pieces and overlooking the garden, this airy sunny room is an ideal place to relax. A fire will be lit in the cast iron and marble-surround fireplace when the weather is cold. Relax on the sofa and chairs to watch T.V. or read the papers and magazines provided. There are several bookcases of books to peruse and also folders containing brochures about local attractions and activities. A number of family pictures adorn the walls and one alcove contains a display of works by a local photographer, Ian Peters. There is a display of locally made cards and a selection of home made jams and jellies for sale. Whether you like sun or shade there will be a spot for you in our peaceful, attractively laid out gardens. Relax on the front or back patio after work, a busy day sightseeing or a hike in the local countryside. You can enjoy tea and home made cakes or shortbread, which are always ‘on tap’. 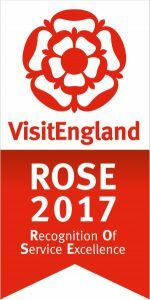 Sit back and savour the country sounds, blossom and shrubs planted in the garden. Spring hosts a magnificent pale pink magnolia planted adjacent to our visitors’ rooms and set against a backdrop of yellow forsythia, daffodils and narcissi. Summer always brings a vibrant show of colourful bedding plants along the drive and in tubs by the pond and patios. Autum colour is provided by a variety of shrubs and Japanese anenomes. If you are interested in fruit and vegetable gardening there is plenty to explore as well. We grow and regularly crop gooseberries, currants, strawberries and loganberries, and are the proud owners of two large asparagus beds (ready in May – June). Other crops include potatoes, tomatoes, beans, courgettes, spinach and beetroot. All produce is used or frozen in the kitchen.